A killer at large in a remote Basque Country valley , a detective to rival Clarice Starling, myth versus reality, masterful storytelling – the Spanish bestseller that has taken Europe by storm. The naked body of a teenage girl is found on the banks of the River Baztan. Less than 24 hours after this discovery, a link is made to the murder of another girl the month before. Is this the work of a ritualistic killer or of the Invisible Guardian, the Basajaun, a creature of Basque mythology? 30-year-old Inspector Amaia Salazar heads an investigation which will take her back to Elizondo, the village in the heart of Basque country where she was born, and to which she had hoped never to return. A place of mists, rain and forests. A place of unresolved conflicts, of a dark secret that scarred her childhood and which will come back to torment her. Torn between the rational, procedural part of her job and local myths and superstitions, Amaia Salazar has to fight off the demons of her past in order to confront the reality of a serial killer at loose in a region steeped in the history of the Spanish Inquisition. An FBI trained female detective, a serial killer with odd fetishes, and a mysterious mythical creature lurking in the woods – there’s something just a smidge X-File-ish about The Invisible Guardian, the first in a trilogy of crime novels by Spanish author, Dolores Redondo. CSI and Miami Vice lurk in the background too, the former with reference to its impossibly fast turnaround of forensic evidence, and the second in relation to the sartorial affectations of one of the detectives. The Invisible Guardian works best when it pulls focus on its Spanish setting. Indeed, the book has already been identified by Spanish reviewers as a ‘landscape thriller’, an apt description for a crime novel where place plays such an instrumental role. In this case, the landscape that is doing the thrilling is that of the Basque country of Northern Spain, a remote and inaccessible locale with its own peculiar history and language. This is where the familiar meets the strange. 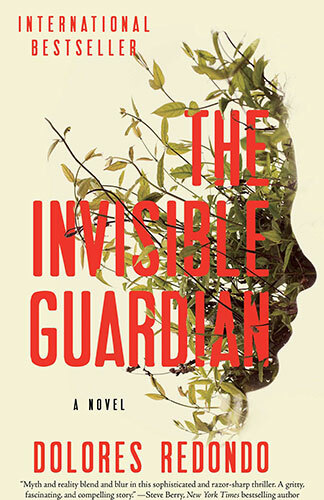 On first appearance in 2013, The Invisible Guardian was published in all four of the official languages of Spain: Spanish, Catalan, Galician and Basque. Now re-published in 32 languages, including a puzzler called ‘World-English’, the trilogy has been optioned as a film by the German co-producer of the Swedish Millenium telemovies and Wallander series. It probably won’t be too long before Australian viewers will be on their armchair tourism way to Northern Spain, courtesy of SBS. Tall, blonde and efficient Inspector Amaia Salazar is based in Pamplona, a city famous for the annual ‘running of the bulls’. This activity, Redondo notes in passing, thrilled author, Ernest Hemingway. True to form, this is an event that also thrills Amaia’s American husband, the impossibly handsome, rich and devoted James. Lest their domestic scenario appear too idyllic, Amaia’s great sadness is that she cannot fall pregnant and she had a horrible childhood. She is, however, very good at her job, having been trained by the FBI in Quantico. Shades of Clarice Starling in Silence of the Lambs begin to appear. Amaia’s FBI training comes to the fore when the body of a thirteen year old girl is discovered by the river, not far from the picturesque village of Elizondo where Amaia herself grew up. Two more bodies are discovered, all arranged in a fetishistic manner with the odd addition of a local pastry known as a txantxigorri. With her combination of local knowledge and FBI know-how, Amaia is appointed to lead the investigation, and heads for ‘home’. So far so very conventional in serial-killer landscape-thriller terms. Elizondo is where the particularities of place are most pronounced. Amaia has to cope with such local characters as the hairy basajuan, the protector of the forest, and the persistence of a belagile, or witch. Far more terrifying are the recollections of her mad mother and the presence of her two warring sisters now at logger-heads over the management of the family bakery. Typically, they all consult the Tarot cards for advice on how to handle what confronts them. Maybe the poetry of the original loses something in the original; maybe it’s the uneasy combination of American genre conventions and Basque myth, maybe it’s the abrupt ending signalling a sequel; but something doesn’t quite gel in this hybrid mix. It will, however, make for a great location shoot.